Recently announced, General Motors (GM) pledges to source electricity for its 350 operations in 59 countries with 100 percent renewable energy from wind, sun and landfill gas by 2050. GM aspires to institute climate change across the world with its electrified vehicles, efficient manufacturing and latest renewable energy goal. General Motors has made a substantial impact world wide since it was founded in 1908. It is one of the largest car manufacturers with operations across six continents. GM is the number one automotive user of solar energy and is among the top 25 solar powered companies in the United States. General Motors began its sustainability journey in 1995 when it partnered with the Environmental Protection Agency (EPA) to implement energy and the environment into their business plan. Since then, GM has made vast improvements in operations, manufacturing, and production, leading to the achievement of energy reduction and awards in sustainability from the EPA. Over the last decade, GM launched solar arrays at 22 facilities, is using landfill gas at 3 and will soon be benefiting from wind power at 4. Solar capacity at GM totals 48 megawatts. The company is realizing an annual savings of $5 million from their renewable energy production and forecasts increased savings as they continue to improve and work toward the goal of 100% renewable energy. Renewable energy is energy generated from natural resources such as sunlight, wind, rain, tides and geothermal heat. Choosing renewable sources of fuel over fossil fuels can decrease a building’s source Energy Use Intensity (EUI). An EUI is the energy consumed per square foot, per year at a building and are further distinguished as site and source. According to the EPA, site energy is the amount of heat and electricity consumed by a building as reflected on your utility bills. While source energy represents the total amount of raw fuel that is required to operate the building. It incorporates all transmission, delivery, and production losses. GM’s commitment to increasing renewable energy while reducing operating costs will reflect positively (decrease) both site and source EUI. General Motors has made and surpassed several energy reduction goals and commitments over the last 20 years. In 2008, General Motors made the commitment to ensure that half of its manufacturing plants are landfill-free. GM has stuck to their commitment of reducing the total amount of waste created in all facilities. Today, GM has 131 landfill-free facilities. In 2011 GM entered all of their facilities into the Energy Star Challenge for Industry. 30 U.S. facilities meet the challenge by reducing energy intensity by at least 10 percent in five years or less. Today, 73 facilities meet the EPA Challenge for Industry. In 2015 General Motor’s Global Energy Manager, Al Hildreth spoke alongside Lunch & Learn workshops in Grand Rapids and Detroit. Hildreth shared first-hand, GM’s best practices and ways they optimize building operations. 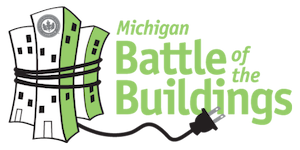 The Michigan Battle of the Buildings Program is an awards and recognition program for energy use reduction open to all Michigan area commercial & industrial buildings. The program encourages energy efficiency and uses energy benchmarking to recognize the Biggest Losers across the state. General Motors could be up for a Battle of the Buildings Award at the next Earth Day Energy Summit, as Hildreth entered 10 GM buildings into the 2016 competition. General Motor’s commitment to our environment and leadership in our communities is admirable on many levels. The company continues to challenge itself each year as they publish their sustainability reports and reflect on the previous year’s accomplishments.